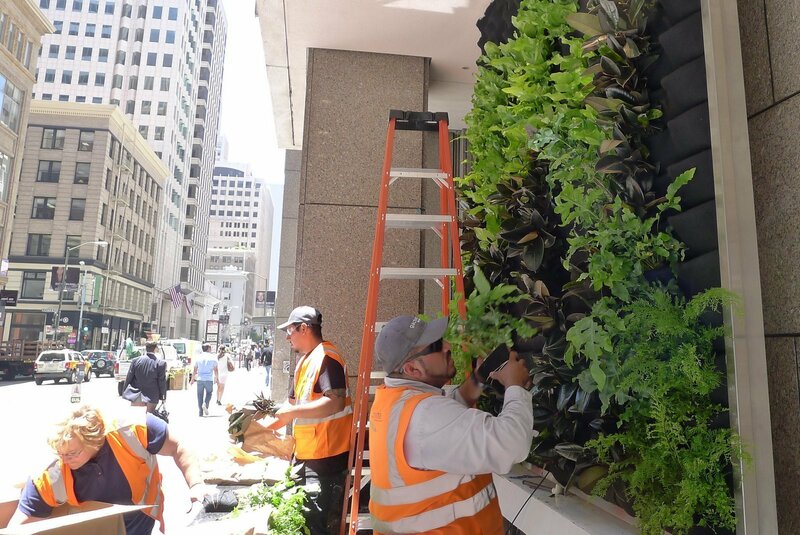 Chris Bribach of Plants On Walls completed a stunning 100 square foot living wall, tucked beneath CBRE’s corporate towers at 100 Pine Street in downtown San Francisco. 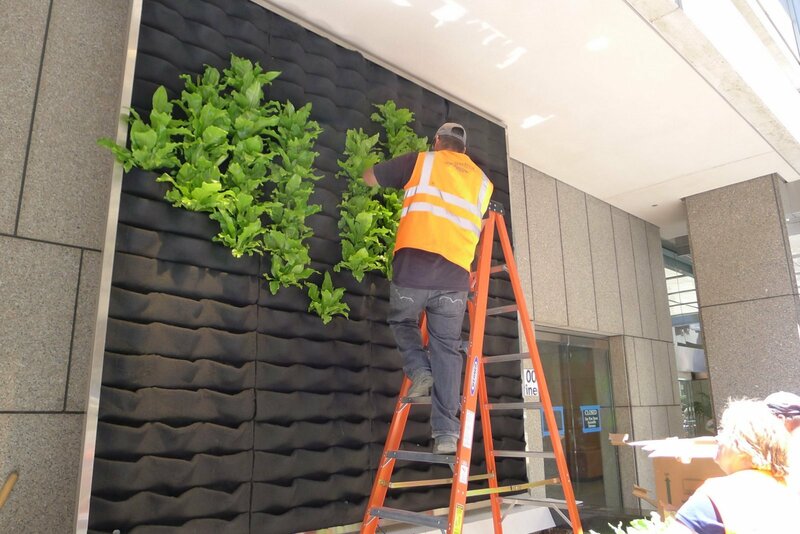 The massive wall uses 240 plants as the finishing touch on a redesign of the company’s street signage, bringing a distinctive, eco-friendly flair to the entrance. Chris Bribach, Plants On Walls. CBRE Installation. Florafelt Vertical Garden. 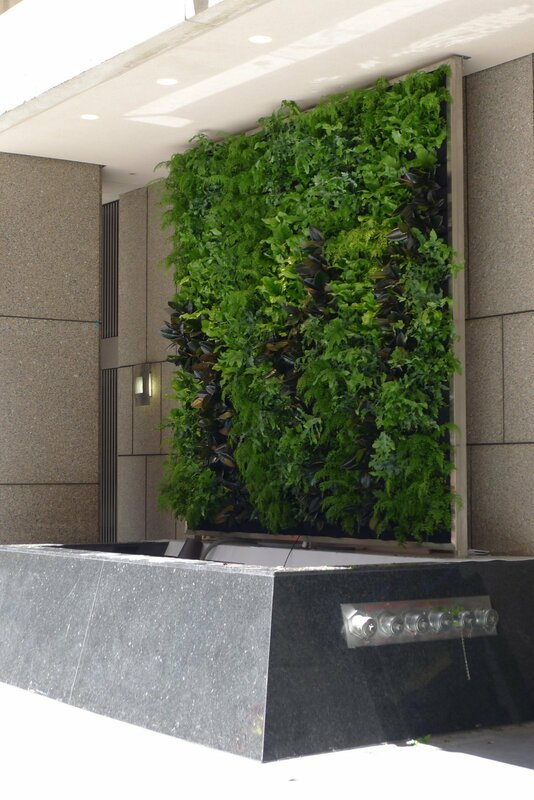 Chris directed a team of installers from Cachina Landcape Management to arrange the ficus decora (rubber-tree), birdsnest fern, mother fern, and bear-paw fern on the stainless steel-framed Florafelt vertical planter system, installed by R.N.Feild Construction. 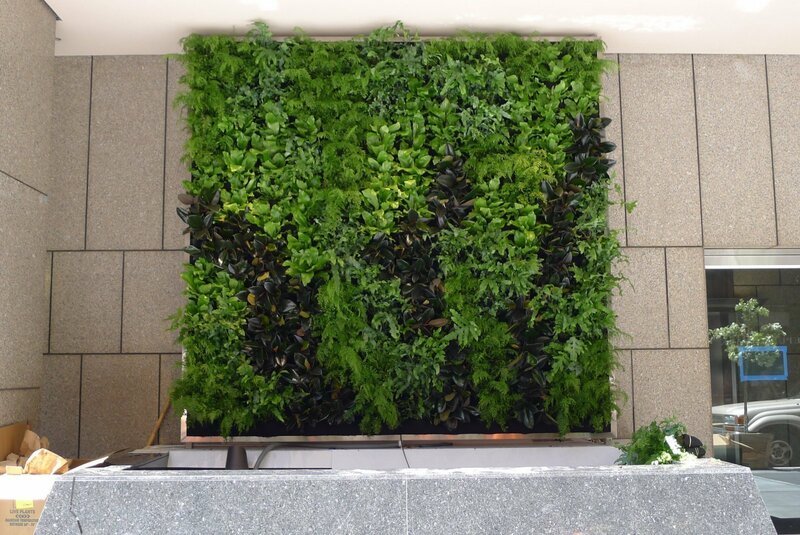 The frame collects water at the base, which drains into the planter below. The wall is irrigated with a 1/4″ soaker hose tucked into the top row of pockets, so that water wicks down the inside layer to the bottom tray. The plants draw water from the moist back layer and the roots will grow into the felt permanantly, locking themselves into the internal felt layers. The visual design is intended to create the feeling of a view into nature. The birdnest ferns hover in the upper region to create a tree-like canopy as they grow, and recessed lighting from above will give them an ethereal glow. Below, horizontal columns of ficus decora create the impression of tree trunks, and will drop long roots to the ground. The bear-paw and mother fern frame the other imagry to create a jungle-scape of shade loving ferns.